Bananas are first thought to have been cultivated as early as 3000 B.C. in Papua New Guinea. Though most of us think of the banana as the fruit of a cute stubby tree, its actually classified as perhaps the largest of all flowering herbaceous plants. As you can guess, there are hundreds of cultivars of bananas currently being grown and for a variety of different reasons too — to be eaten raw as a sweet starchy fruit we know and love, to be cooked, or even to be harvested for its fibrous material. In Hawaii we see a variety of dessert bananas (sweet to be eaten raw) as well as cooking bananas being grown on farms and backyards. Fruit grows in clusters that can contain anywhere from 50-150 fruit, the full bunches we see at the markets are called hands, fruit is sometimes called a finger. Bananas, called mai’a in Hawaiian, were probably one of the early canoe foods and over the centuries here in Hawaii, varieties were selected and cultivated according to microclimate and use. By the time Captain Cook arrived, over 50 varieties were being cultivated here. 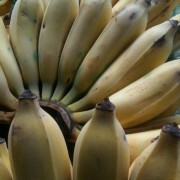 Now, Apple Banana is probably the most commonly grown banana in Hawaii. Its smaller than the common banana usually seen in supermarkets in the U.S., which is the larger and somewhat blander Dwarf Cavendish that dominates the global market not because of superior taste but because it ships well. Apple bananas have a sweeter taste and some say a touch of tartness. Also spotted in the farmers market lately are Cambodian dessert bananas and green cooking bananas. Bananas are known for their creamy sweetness. They make a perfect snack food as they “prewrapped” in their own biodegradable peels, and do not have to be refrigerated! They are also a great source of vitamin B6, moderate amounts of vitamin C, manganese and potassium. They are also a good source of soluble fiber. Heads up: people with an allergy to latex may experience a reaction to bananas. – It is thought that antioxidant levels are highest in a banana at the point it reaches overripeness. – Bananas are most commonly eaten raw – alone, sitting on a pile of ice cream and about to be drizzled with fudge, slathered with peanut or almond butter, demolished into a smoothie, dipped in chocolate, rolled in chopped nuts (with or without the chocolate). – Bananas can be fried, roasted, wrapped in all kinds of things and deep fried, folded into pancake batter and flipped, baked in breads and muffins. – Bananas can be grilled in their skin until warm and soft, split skin and spoon out. – Green cooking bananas are not so sweet, so they are prepared and eaten more like a starch — like potato or ulu. – Plaintains can ripen and as they ripen, their high starch content also turns to sugar. Some recipes call for very green and some call for ripened. – Before preparing plaintain a common kitchen trick is to moisten hands with water and rub with salt to prevent juices sticking to your hands. – Wash, cut off an inch off each end. – Then make vertical slit with knife one each side. – Drop them into very hot water and let sit there for a few minutes to help loosen the skin. Remove from water and let cool. – Using tip of knife slowly seperate peel, free the fruit from the peel. – Soak the peeled plaintains in salted water and drain before cooking. 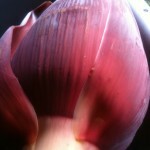 – Like in artichoke the inner fleshy part of the bracts and the heart are the edible parts of a banana blossom. It’s used as a vegetable in South Asian and Southeast Asian cuisine – raw in salads, steamed or cooked in soups and curries. The flavor resembles that of artichoke. 1) Wear an apron or clothes you don’t mind getting stained – banana juice/sap stains pretty bad. 4) Cut the blossom in half lengthwise. It will look artichoke like in structure. 5) Core each blossom half. 6) Thinly sliced each blossom half with a knife or with a mandolin slicer, placing in lemon water immediately to prevent blossom from turning black. – Banana leaves are so very handy because they are large, flexible, and waterproof. They are often used as beautiful, non-stick, ecologically friendly “plates” in South Asia and several Southeast Asian countries. When added to the steaming of dishes they lend a subtle sweet flavor. The succulent leaves contain the juices that protect food from burning and add a subtle flavor, which is why many wrap food in banana leaves when grilling. Leaves are also fully dried to be used as packing material for food stuffs and also to make cups to hold liquidy foods. You can find bananas at all stages of ripeness at a farmers market. Pick according to when you’d like to eat them or how long you’d like them to last through the week. Look for one that are free of splits in the peel or damage. Size does not affect quality. A few black spots on Apple Bananas are a sign of ripeness, not rot. Though bananas look pretty tough, they are fragile. Take care in transporting them safely to sit on your kitchen counter – out of direct sunlight. If bananas are too green and you are losing patience, they can be put in a brown paper bag or wrapped in newspaper to speed up the ripening process. If bananas are ripening faster than you can eat them, once fully ripened, they can be put on the refrigerator where they will proceed to turn black but this will not greatly affect their taste. Before eating bananas you have refrigerated, allow them to sit out and regain room temperature. Never refrigerate unripe bananas — the chill will interrupt the ripening process. 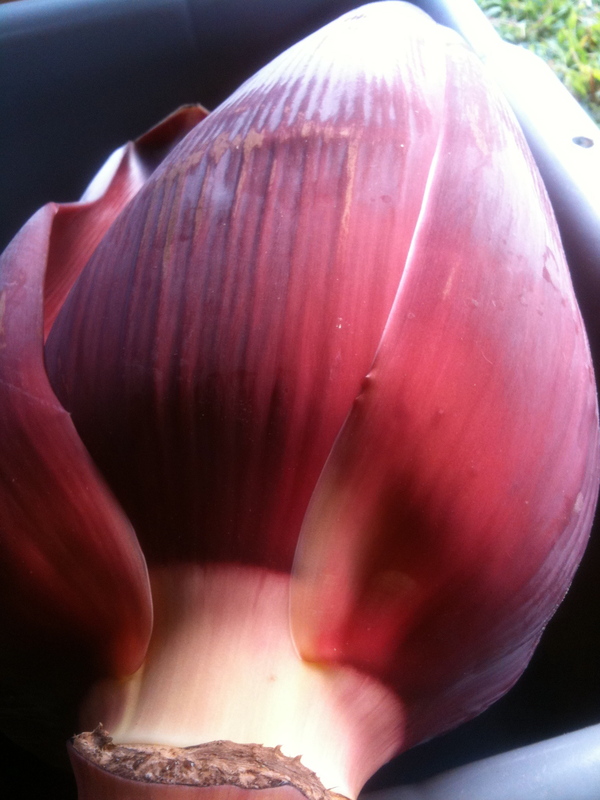 Look for banana flowers whose leaves are high in color, a very rich purple. Leaves should be tightly packed, firm and pliable, with no sign of decay. If not using it immediately, wrap tightly in plastic wrap and store in fridge for not more than a few days. Use quickly as possible. In Japan, from at least the 13th century, bananas were cultivated for clothing and household textiles. Leaves and shoots are cut from the plant at specific intervals to ensure softness. Once harvested shoots were boiled in lye and fibers were then prepared for yarn-making. Japanese banana shoots produced fibers of varying degrees of softness, each for specific uses: the coarse outermost fibers of the shoots were used for tablecloths, the softest innermost fibers were used for kimono and kamishimo. This traditional process was composed of many steps, all performed by hand.